Fat Tuesday: This is the day before Ash Wednesday (which I will explain next). Basically it is a day to go out, drink, stuff your grocery hole as much as possible and get crazeeee with your friends because for the NEXT 40 days, you have to be good. 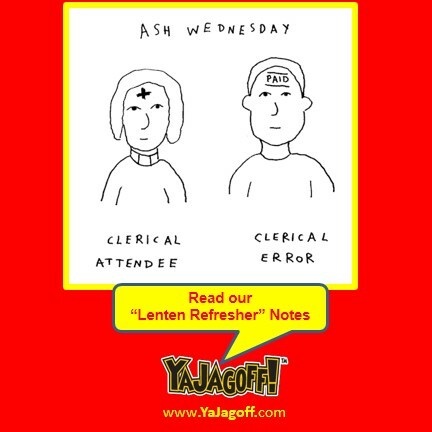 Ash Wednesday: If you’re not hung-over or sick from your pig-out and you are lucky enough to wake up in your own bed, you find a way to go to church and get ashes put on you’re forehead. Most folks search for the church that gives JUST ashes as opposed to the churches that make you sit through an entire mass to get them. Also, if you’re ashamed at work, you kind of find a way to say you ACCIDENTALLY wiped them off while thinking about that big project! Lent: If you play by the rules, for the next 40 days you decide to give up some vice. You do this to repent for all of the sins you committed since LAST EASTER! If you’re smart, this is a chance to RENEW that “failed” New Years commitment of losing weight by giving up eating in between meals or late-night snacks. One other note, if you’re REALLY SMART, you realize that the Catholic rules allow you to go off the wagon on Sundays and go back to your vice for a day. Holy Friday: If you’re in Catholic School you LOVE this day because you get the day off. If you’re a public school kid, you hope that Easter Break starts before this but your SOAPWORDing MAD that your Catholic buddies get the day of to go skiing or play X-box. Easter Sunday: You are done FASTING or SACRIFICING and you get back to your old habits!!! You stuff yourself with chocolate and jelly beans – because you want to celebrate a Christian Holy Day just like they did back in Jerusalem when they found the stone rolled back and the tomb empty… gorging yourself with buttered-popcorn-flavored jelly beans and eating hard boiled eggs full of fake dye! When Dirty Kurty and I were in Catholic School – public high-school kids would ask us about what to wear at church for Easter because they only went once-a-year. 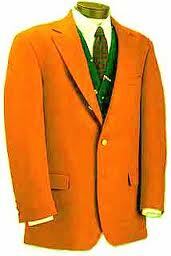 We used to tell’em that the church “changed the rules” and expected all adolescents to wear BRIGHT ORANGE SPORT COATS. We told them that was the ONLY way they would fit in or look “normal.” We would charge them $5 for the advice. Dirty Kurty and I happily sat through ALL FOUR Easter Sunday masses, each year, just to be ENTERTAINED by those who would show up in BRIGHT ORANGE COATS! Even better, we charged those same kids $1 for a church bulletin (the only way to prove to your parents that you attended mass) on the way out….they didn’t know they were free! So guess what I’m doing for lent? I’m giving up snacking after 6pm cuz I am STILL feelin’ the guilt over the 401K account me and Dirty Kurty built on taking money from those once-a-year Easter Churchins!!!!! Happy Lent! Here’s to the next 40 Friday’s of smelling like fire department and church fundraiser fried fish, Ya Jagoffs! Previous articleAhh… #@# it! I’ll just turn!